Ben Sanders, The Kiss (2018). Acrylic, oil, and enamel on panel and MDF tile board, foam pool noodles, 75 x 62 inches. Image courtesy of Ben Sanders and Ochi Projects. The 1912 gospel song “In the Garden” describes a moving, solitary encounter with Jesus in a garden—a metaphorical account of personal salvation. Over the past century, it has been interpreted by a wide range of artists from Mahalia Jackson to Loretta Lynn, Johnny Cash and Elvis. 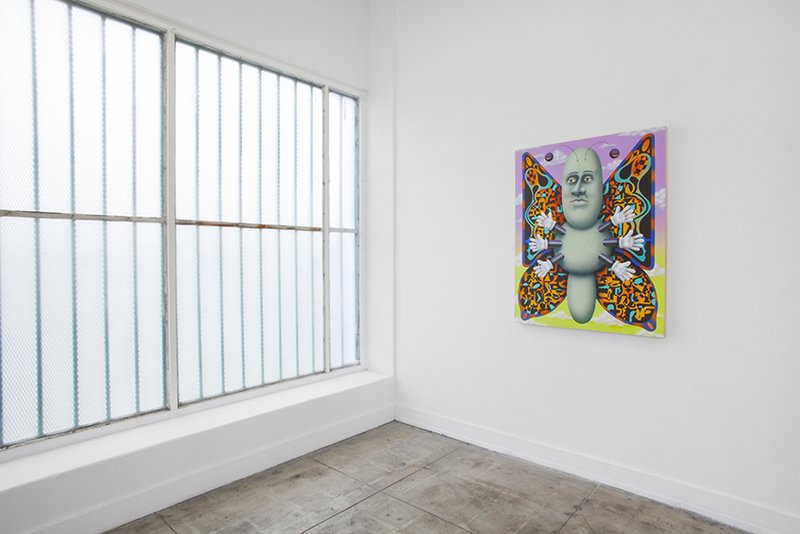 L.A.-based artist Ben Sanders borrowed the song’s first line for the title of his solo show at Ochi Projects: I Come to the Garden Alone (an appropriate choice given the singular and idiosyncratic style of his paintings and drawings). The drawings, several of which functioned as studies for the larger paintings, were made while Sanders sat in church, as if subconscious visual interpretations of the religious service or perhaps confessions of a wandering mind. 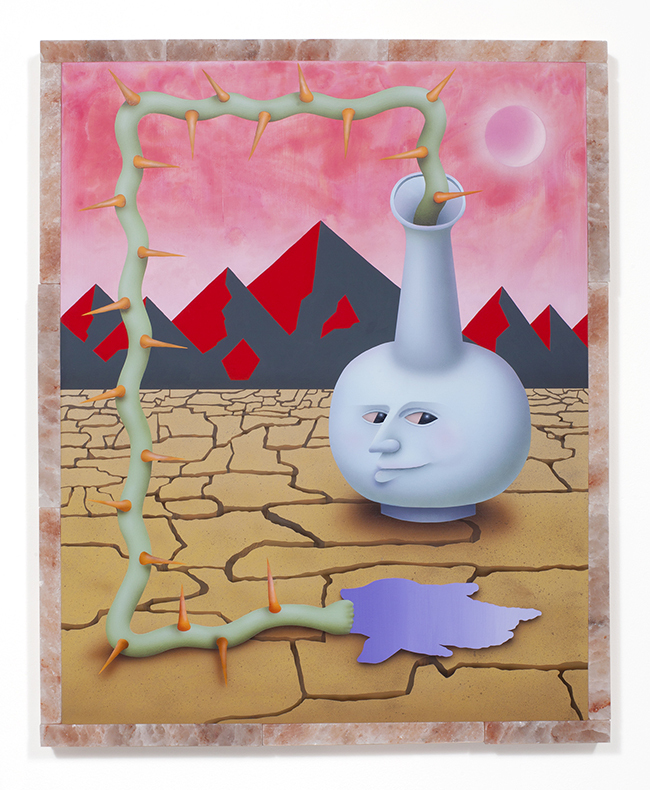 The works draw on a smorgasbord of popular and art-historical references: lowbrow pop surrealism, ’60s counterculture cartoons, ’70s stoner artwork, ’80s new wave graphics. Faux finishes, airbrushed shapes, and hand-painted objects share space on each canvas. They also incorporate unconventional media: The Know-It-All (2016–17) is framed by slabs of Himalayan pink salt, while The Kiss (2018) features a grid of white MDF tiles on its surface, and sections of bright, squishy pool noodles act as its frame. Despite these far-flung references, most of the works update traditional genres of landscape and still life. 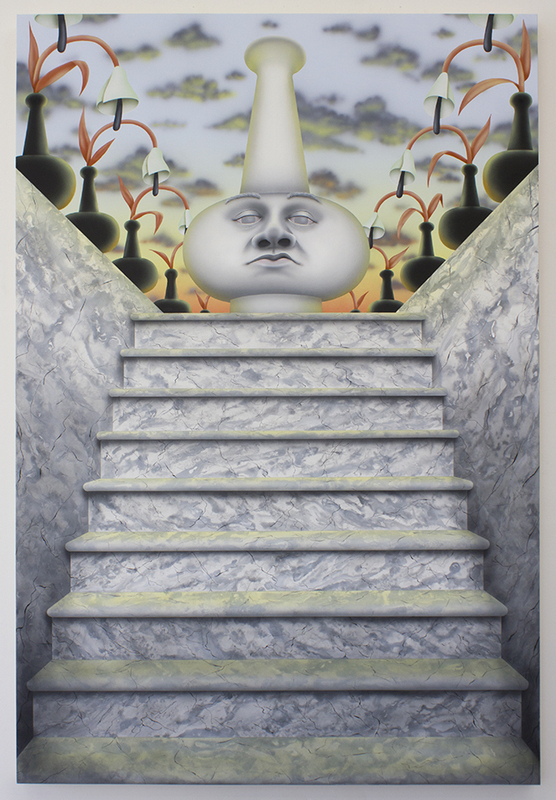 The Table (2017) depicts a wedge of cheese, radish, tomato, golf balls, and an anthropomorphized vase resting on the titular object, rendered with a detailed wood grain that wraps around the sides of the canvas. The tabletop is flipped up, the space compressed, as in a Cézanne. The Kiss could be read as a contemporary Vanitas image, and a warning against excessive hedonism. 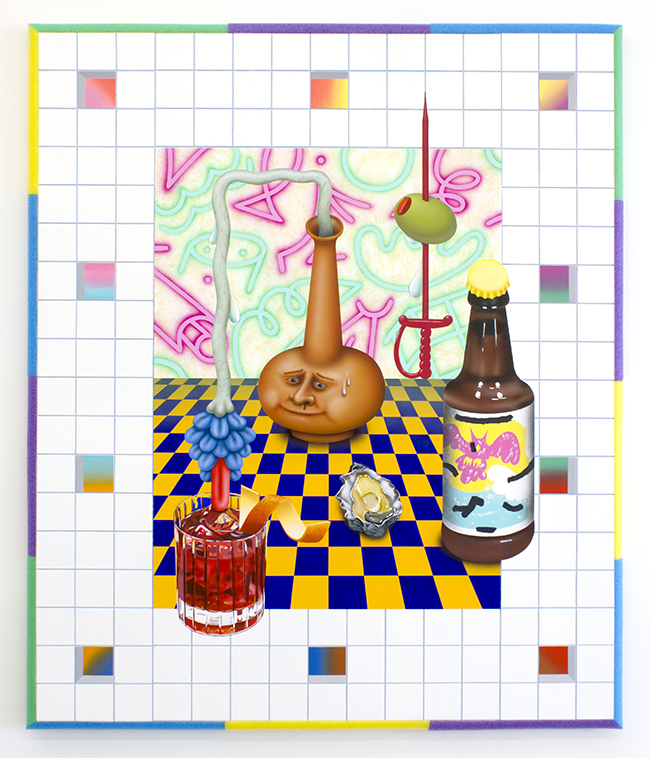 Against a frenetic background of neon shapes and a blue and yellow checkerboard pattern, another personified vase sits surrounded by a beer bottle, oyster, glass of Campari, and an olive skewered by a cocktail sword. A flower sprouting from the vase’s opening extends a bright-red tongue into the lowball glass. A bead of sweat drops down the vase’s face, as a trickle of blood flows from its nose—as if overloaded by the visually garish environment surrounding it. The central figure in many of these works is the Teleflora vase. Once used to send flowers to loved ones through floral wire services, they are now relegated to thrift store shelves. Seen in this way, the Teleflora vases take on the role of the song’s protagonist, solitary figures in search of redemption. The works without vases feature insects, and could be considered portraits as they are lacking in any real accompanying objects or landscape elements. In The Night Ant (2017), several airbrushed, geometric forms make-up a large ant, with a detailed human face with delightful eyebrows, each hair a unique brushstroke. Smooth spheres and columns make up the legs, like branches of Peter Halley’s abstract circuitry. The Seraph (2017) is the most clearly religiously-referential of the paintings, depicting an angelic being with stained-glass style wings. It lacks the grace and beauty we have come to associate with angels however, instead being a somewhat comic and grotesque figure: a butterfly with six gloved hands, green skin, and a second set of eyes that erupt on stalks from its forehead. In Sanders’ cosmology, even heavenly creatures are solitary, strange, and a little bit sad. After viewing the paintings in the main gallery, the upstairs space features several small drawings, studies which offer scant perspective, instead illustrating how little the works change from sketch to painting. Perhaps it is the art historian in me, but I ended up wanting to see more development between the two bodies of work, some fleshing out and refining of the stream-of-consciousness ideas sketched out in a church pew. Viewing Sanders’ paintings is gratifying, even if not instantly so. It takes some time to ingratiate oneself with his distinctive stylistic and narrative constructions. Even then, many of his references remain obscure, like arcane illuminations in a medieval manuscript. Sanders’ heterogeneous mix of style, techniques, and materials could be said to aggressively flirt with bad taste—even if it is a bad taste that is particularly on trend at the moment. What keeps these works from simply being throwback pastiches, however, is the curious cast of characters that are at once relatable and quite alien. Although born of Sanders’ personal, spiritual experience, they offer viewers myriad paths through the fantastical garden he has created. 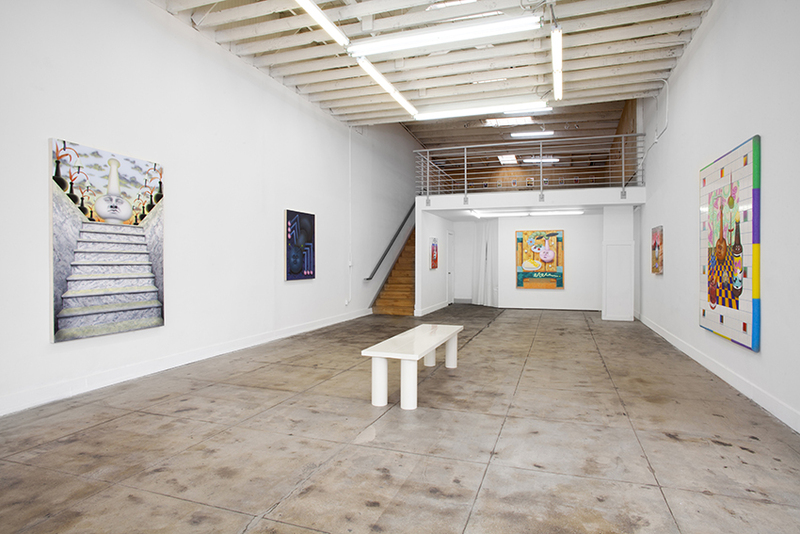 Ben Sanders, I Come To The Garden Alone (2018) (installation view). Image courtesy of Ben Sanders and Ochi Projects. Photo: Josh Schaedel. Ben Sanders, The Power (2017). Acrylic on panel, 72 x 48 inches. Image courtesy of Ben Sanders and Ochi Projects. Ben Sanders, The Know-It-All (2016-2017). Acrylic, flashe,and oil on panel, Himalayan pink salt frame, brass hardware, 32 x 26 inches. 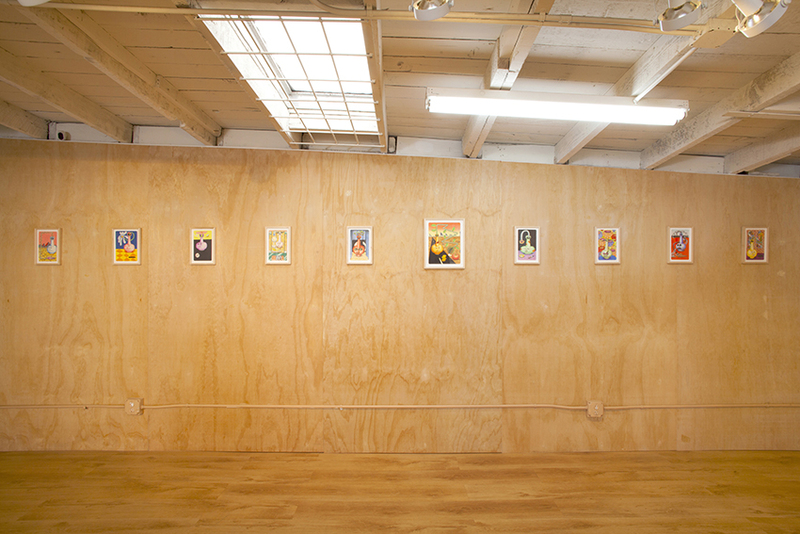 Image courtesy of Ben Sanders and Ochi Projects.